15/85 Kim Hollis Gorgeous and unique, like a Miyazaki film should be. You'll absolutely fall in love with the characters. 73/166 David Mumpower Unlike more storied Studio Ghibli productions, Howl does not translate well stateside. Its weirdness overwhelms a wonderful concept. After delighting audiences in Japan for many years, North American audiences are finally starting to know the name Hayao Miyazaki. Over the years, this talented and artful writer/director has created amazing new worlds through the medium of animation. His expressive films have ranged from environmental treatises (Nausicaä of the Valley of the Wind and Princess Mononoke) to simple childhood fairy tales (My Neighbor Totoro) to insightful coming-of-age-stories (Kiki's Delivery Service). Spirited Away, the highest-grossing film in Japanese box office history, is the film that truly established Miyazaki as one of the most brilliant animators working today. While those inside the business already saw him as an influential figure in their world, it was Spirited Away's Academy Award win for Best Animated Film that increased the director's exposure to a wider audience. Since that time, the Walt Disney Company successfully released the DVD version of Spirited Away alongside two of Miyazaki's early works -- Laputa: Castle in the Sky and Kiki's Delivery Service. Based on the success that those titles found, the studio is now planning to release the entire Studio Ghibli catalog (Studio Ghibli was founded by Miyazaki and includes all of his films in addition to some other wonderful animated features such as The Cat Returns and Only Yesterday). Some will see actual theatrical release (Princess Mononoke will return for its second theatrical run in its subtitled version) and others will go direct-to-video similar to Castle in the Sky and Kiki. 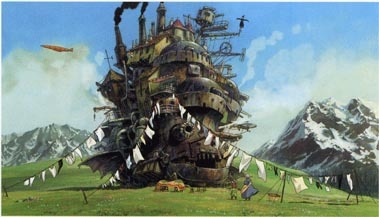 Those films will be nummy treats leading up to the North American release of Miyazaki's next film, Howl's Moving Castle. Based on the charming children's fantasy book by Diana Wynne Jones, the planned Japanese release date for Howl's Moving Castle is autumn of 2004. From that point, it will probably be 2005 before it hits screens in the U.S. and Canada. The book subtly straddles the divide between an ancient fairy tale past and the world of today. Our heroine is an 18-year-old girl named Sophie Hatter, who lives with her stepmother and two younger sisters in a hat shop that was left to them when her father died. Times are tough and it's hard to make ends meet, so the two younger girls are sent off to apprentice with a white witch and a baker. Sophie, the eldest, is left to assist her stepmother (who actually isn't evil) to run the hat shop. Things get complicated rather quickly, as the two younger girls have done a spell to trade places, which naturally leads to a great deal of confusion all around. Even worse, there appears to be an evil wizard named Howl who is preying on the local girls. Of course, in this world, "preying" means "leading them on and then breaking their hearts." Sophie, though, gets stuck with the greatest difficulty of all. A misunderstanding of words leads the malevolent Witch of the Waste to transform our heroine into an old woman. Clearly, she can't stay at the shop as no one will know who she is, so Sophie sets out to try to get turned back into her normal self. For better or for worse, Sophie finds herself taking unexpected refuge at Howl's castle. This strange fortress can move about, has various doors that open to different worlds/times/realities, and is a filthy mess. The place is powered by a moody fire demon named Calcifer, an ethereal being who lives in the fireplace and is bound by a contract with Howl, who is himself a charming but highly irresponsible young wizard. Calcifer makes a deal with Sophie: if she can find a way that the contract between the fire demon and Howl can be broken, Calcifer will break her curse. Matters are only more complex because Calcifer is unable to reveal to Sophie the details or nature of the contract. Somehow, Sophie convinces Howl to take her on as housekeeper. She must contend with his annoying behavior (and the additional aggravation of Calcifer's constant whining) while she works to break both the contract and the spell. Naturally, the Witch of the Waste plays a further role in the story as things progress. Howl's Moving Castle will mark a discernible departure from the bulk of Miyazaki's past directorial efforts. With the exception of Porco Rosso (which featured a man in a pig's body) and Castle of Cagliostro (which had a 30-something detective as its hero), Miyazaki's movies have had young people as the central characters. With ages ranging from the probably five-year-old Mei in My Neighbor Totoro to Princess Mononoke's nearly adult Ashitake and San, youth has prevailed, with the older characters being relegated more to caricatures. Miyazaki did break away from that trend with Spirited Away, though, as Yubaba/Zeniba and Kamaji were given very distinct looks and personalities. Still, these characters were there as part of Chihiro's journey -- the preteen girl was still the film's focus. It's the rare story indeed that features a protagonist that also happens to be a senior citizen. Jones has mentioned that she discovered in the process of writing her book that old ladies happen to offer up more opportunities for humor than young girls. In order for the movie to be appealing, though, the heroine will still have to be attractive. Miyazaki and crew face quite a challenge in creating just such a central character. On the other hand, the landscapes and scenery promise to be lush and exquisitely detailed. One of the director's great strengths is creating intricate backgrounds and meticulous settings. The author set her characters in a backdrop the derives heavily from the moorlands of Wales, but the Ghibli team will be modeling the film's scenery after the French region of Alsace -- a land that has a terrific fairytale look.